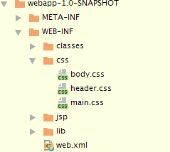 How would I go about including a jar file that I added as a dependency on netbeans maven project on my jsp file? I would like to include this onto my jsp page. This is a Maven project. The fact that you're editing it under NetBeans is secondary. The same rules would apply if you were using Eclipse as your editor. Maven's normal action for a dependency marked as run-time when executing the "war" goal is to copy it from the cached repository to the webapp's target WEB-INF/lib directory. But there are 2 problems with that. First, anything under WEB-INF is invisible to client URL access. Also, URLs cannot resolve directly members of archive files such as JAR files, only discrete files and directories. If that sort of mechanism isn't an option, then the alternative would be to manually pull the scripts from the jar in the Maven repository and copy them to a suitable subdirectory under the Maven src/main/webapp directory. For example, if the JAR contained "/jquery-min.js", then if you copied it to PROJECT/src/main/webapp/scripts/jquery-min.js", the context-relative URL would be "/scripts/jquery-min.js". Assuming that no servlet was mapped to handle a URL beginning with "/scripts/". I believe Eddy is using WebJars. Ah, I see. But it's a little trickier than that. For Servlet 2 containers (for example, Tomcat 6), you would indeed have to include a resolving servlet. WebJars provides one and you'd code the URL path to use it. That would also require require mapping a URL pattern, for example, map "/webjars" to the webjars servlet. Servlet 3 is different, however. I'd wager money that you could actually retro-fit Tomcat 6's default servlet, but why bother - user Tomcat 7 or later (or some other Servlet 3 container). In Servlet 3, you do not have to provide a servlet mapping, so the resource is mapped to the root of the webapp. Any fine-tuning is optional. Aside from the improper use of single-quotes in the tag, the Servlet 3 docs would imply that the JAR path /META-INF/resources/css/bootstrap.min.css would cause /css/bootstrap.min.css to be presented as a public URL. Note that I haven't address the higher-level parts of the URL (server and context root and relative versus absolute URL syntax). Just the internal resource path. I'll leave the rest to you. Incidentally, the attribute syntax using the subtag "wj:locate" is presumably a custom JSP tag injected by the webjars infrastructure and which probably renders a webjars servlet path. I didn't find anything about it on the webjars site, though. WebJars appears to be redundant in Servlet3, since the container's default servlet can already serve up WEB-INF/lib jar resources. Its primary virtue would appear to be for Servlet2 containers. So maybe their Servlet 3 example is actually correct, but is injecting and mapping a webjars servlet even though it's not necessary in Servlet 3. Which would presumably be for backwards compatibility. I am glad that this forum is alive and kicking!